Kartemquin Films has developed a national outreach campaign that builds on the film’s acclaim with critics and festival audiences worldwide as we continue on through 2012. 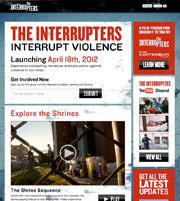 The Interrupters Community Engagement Campaign uses the documentary as the centerpiece of a two-year effort to engage audiences and communities in reflection, discussion and action around the structural causes of street violence, and creative approaches for interrupting the cycle of retaliatory violence. Watch Steve James’ pitch on transmedia engagement from the Tribeca Film Institute Transmedia Lab held at Silverdocs, June 24th, 2011. Click here if you are a school or university interested in an educational dvd for classroom use. When director Steve James and producer Alex Kotlowitz set out to make The Interrupters, their hope was to change the conversation around violence. As James said back in February of 2011, “We hope The Interrupters will play some role in communities-in-need and the film will be part of the solution to these issues.” For each outreach event, it has been the Outreach Team’s aim to involve at least one of the interrupters featured in the film and/or involve local violence prevention organizations that are familiar with what is being done to prevent violence at the local level. With members of these organizations sharing their own personal struggles with street violence combined with the influence of a youth group that offers an alternative to the streets via sports, dance or even basic job skills training, the Outreach Team is confident that not only have we begun a conversation about the problems, but we’ve begun a conversation about solutions. In July of 2011, nearly a month before the film’s theatrical release, The Interrupters celebrated its first major outreach event with The Interrupters Youth Media Summit on Chicago’s Columbia College campus. The event brought together nearly 100 Chicago area high school students from different neighborhoods, races and communities to watch the film, meet the filmmakers, but most importantly it gave young people an opportunity to tell adults about their own experiences with the violence that plagues their lives’ daily. The most repeated phrase from these high school students that day was, “We need to show The Interrupters in my school”. But while reaching out to high schools has been a major goal of The Interrupter Outreach plan, we’ve also been able to screen the film at Youth Correctional Facilities as well. The film has been screened for both youth and adult inmates, probation officers, judges, public defenders and state’s attorneys. One Juvenile Court judge in the Chicago area has made the film required viewing for youth on probation for any kind of gun case or one involving violence. 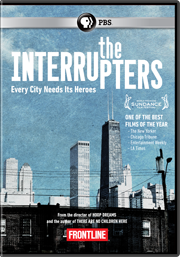 As The Interrupters continued to open theatrically in cities throughout the country, we were able to work with local theatres and use the screenings to begin to take action immediately following the film. At nearly 50 theatrical bookings held from July to January 2012, local theaters were gracious enough to allow local violence prevention groups to talk directly to moviegoers at post-screening Q&As. These theatrical Q&As put the energy of a community screening into movie theatres as local violence prevention groups were able to speak to moviegoers and tell them how they too could take action. The Milwaukee screening was just the first in a series of community screenings of The Interrupters that have partnered with national and even international city halls. In December, a free screening of The Interrupters was sponsored by Philadelphia’s Mayor Michael Nutter and the Mayor’s Commission on African American Males at the Pearl Theatre. This screening brought together a myriad of the city’s organizations from the Philadelphia CeaseFire to youth-led dance troupe, The Dollar Boyz. In February, Oakland’s City Hall held a free public screening, while in Chicago The Interrupters Team screened pieces of the film for Mayor Rahm Emanuel and his staff as well as Chicago Public School CEO Jean-Claude Brizard. In March, the City of Toronto was able to coordinate two screenings for youth from across the city as well as violence prevention workers at the TIFF Bell Lightbox. The Interrupters, Cobe Williams was able to share with Toronto audiences his own perspective as a violence interrupter and what they can do to help prevent violence in their own communities. It is The Interrupters Outreach Team’s plan to have a varied collection of Interrupters Modules available via interruptviolence.com by April 2012. The intent for these modules will be for classroom use, but with a length of approximately 5-15 minutes for each module, these condensed stories will allow for a longer in depth conversation at any community screening as well. Whether a teacher wants to focus on the mentor/mentee relationship of Cobe Williams and Lil’ Mikey or they want to examine Ameena Matthews’s own personal redemption story, The Interrupters Modules will engage the viewer on a number of diverse topics and hopefully transform a classroom discussion into a plan of action. Ultimately, The Interrupters Engagement Strategy will continue its partnership with communities throughout the United States and over the globe beyond 2012. Whether it has been an inner city Chicago classroom or a community center in Paget, Bermuda, audiences have continued to recognize the power and emotion of The Interrupters. However, it seems clear that the impact of this film and the change it creates has just begun.